The Lakes In A Day ultra is a 50-mile race with 4,000m of ascent in the Lake District. 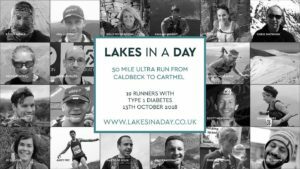 The route starts from Caldbeck, in the north, to Cartmel in the South, via Blencathra, Helvellyn and Fairfield (and several others) before dropping to Ambleside and the banks of Lake Windermere in the southern Lakes. The event is described as “inspiring, daunting and stunning in equal measure” and that’s not just the selection of food at the feed stations. 238 competitors finished the event, male and female winners came in together at 10:45:01; Katie Kaars Sijesteijn and Clarens Olsson of Sweco Adventure Team. Andy Fry was the sole Strider (running for Type1s do ULTRAS), finishing as 55th male in a time of 15:27:03.